Not only is this Thanksgiving Writing Activity loads of fun for students (Who doesn't love learning and writing about Thanksgiving? ), it also pushes students to write across several genres! They will begin by researching The First Thanksgiving and thinking about their own family's special Thanksgiving traditions. Afterwards, a venn diagram will be used to compare/contrast The First Thanksgiving and their own Thanksgiving. Students will then use their venn diagram to help them write a FRIENDLY LETTER, inviting a Pilgrim who has time-traveled to the present to join them for Thanksgiving dinner! Their letter will be PERSUASIVE and mention several details about how The First Thanksgiving and their family's Thanksgiving celebration will be similar and different to each other. Students will practice the Friendly Letter Format, Research, Persuasion, and Compare/Contrast Writing all in one CREATIVE writing piece. 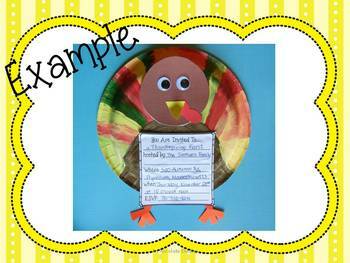 To top it off, they will create a TURKEY INVITATION Craftivity to go along with their letter. 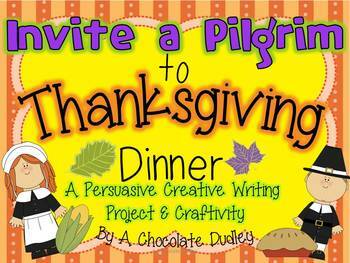 Invite a Pilgrim to Thanksgiving Dinner Example Poster (Great for projecting on a whiteboard).